Oh my, we’ve had such a busy week and an even busier weekend, it’s been amazing. My sister helped me out with my very first supper club on Friday evening which went amazingly well. And then I had the Dublin Vegfest on Sunday which was emotional to say the least; so many like minded people in the one place. I was truly blown away by it. Because of how hectic the weekend has been, both my sister and I were so tired that this week we had hot dogs for our Meatless Monday dinner. We put our slippers on, cooked up some potato chips and had a mini feast. These babies are the perfect quick treat for when you’re feeling tired but they do require advanced prep work. Like most of my other recipes I’ve always got a stash in my freezer for the rare occasion that I’m too tired to cook. I’ve tried many recipes for vegan sausages and non of them worked out too well. Some didn’t hold their shape during cooking while some of the tofu based ones just didn’t pack the flavour punch for me. However, this recipe really hits the spot. Your patience might be tested a little as the recipe calls for overnight chilling and although you might want to gobble up the sausies straight away after steaming them, chilling them overnight helps them hold their shape during frying. You can easily adapt the flavours by swapping the herbs for spices, check out my Chorizo recipe. 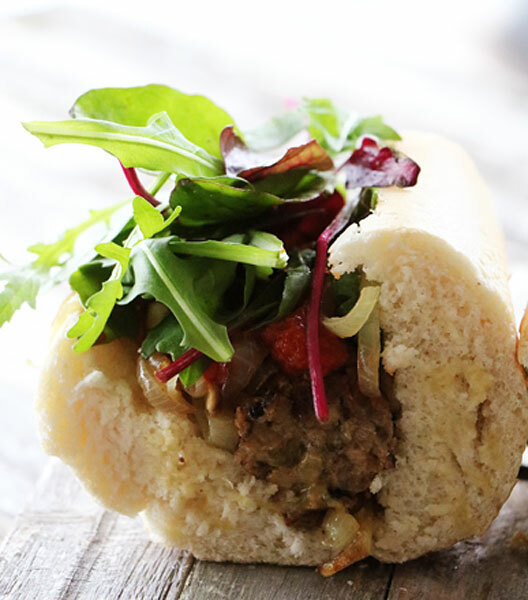 I served my sausies on French baguettes with my Red Pepper Relish, fried mushrooms and onion and some fresh mixed leaves. They also work amazingly well with Colcannon or Mustard mash and Onion Gravy. You can serve them how you’ll like, I’m sure they won’t disappoint. 1 flaxseed egg replacer (1 tablespoon of flaxseed + 3 tablespoons of water = 1 egg binder replacer). Heat the oil in a pan and gently fry the onion, garlic and mushroom along with the herbs. In a large bowl roughly mash the black-eyed peas with a fork. Add the nutritional yeast and stir very well making sure it is spread out well throughout the sausage dough. Stir in the flaxseed egg replacer followed by the rice flour and mix well. You should have a dry dough-like texture at this point. Mix in the salt and pepper, adjusting to your taste. Divide the dough into 8 equal parts. Press each part firmly, making sure there is no air trapped inside the mix. If you have air inside the sausage dough it will not hold its shape during cooking. Roll out the sausage shapes and wrap in foil. Using a metal steamer or a Chinese bamboo one, steam the sausages for 15-20 minutes. Allow to cool before placing in the fridge to chill overnight. You might find it difficult to leave the sausages in the fridge because at this stage the kitchen will be fragrant with their scent, but this vital cooling time helps the sausages to hold their shape so do try to hold back from devouring the lot. 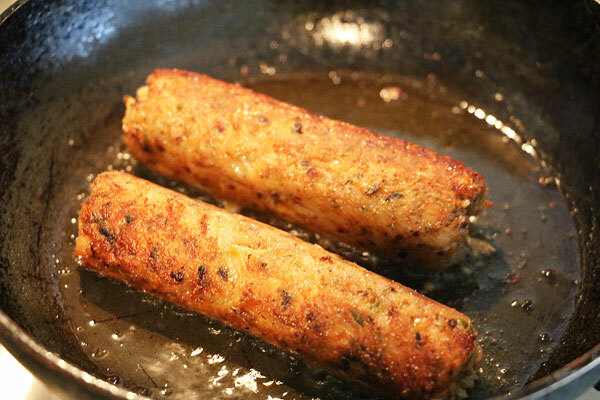 You can cook the sausages in the oven, on a griddle pan or my preferred way of shallow frying. Simply add a little oil to a non-stick pan and fry until crispy on the outside and heated through. 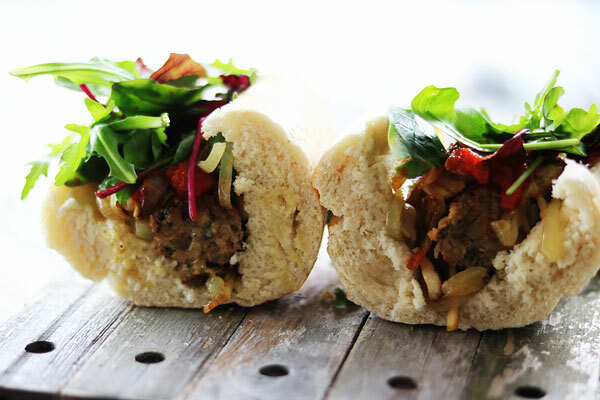 Serve on crispy French rolls with Red Pepper Relish, fried onions and rocket. YUM!!! Hey, I’m a fool. I was wondering if you could elaborate on how to steam the sausages?